The U.S. Court of Appeals for the Fourth Circuit (Maryland, North Carolina, South Carolina, Virginia, and West Virginia) ruled last week that an individual carrying concealed gives up essential Fourth Amendment rights under the presumption that since he is armed, he is also dangerous. The ruling issued on Monday, January 23, United States v. Robinson, reversed an earlier decision by the court’s three-judge panel, claiming that the Supreme Court, in two relevant decisions, concluded that “armed and dangerous” meant “armed and therefore dangerous” rather than “armed” as a fact and “dangerous” based on reasonable judgments surrounding the case. 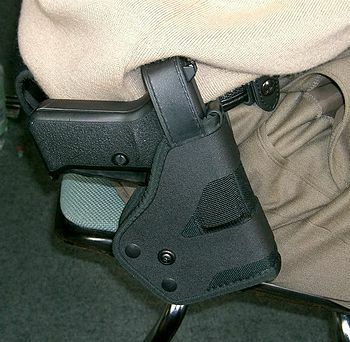 The officer then performed a “Terry frisk” and found a firearm in his pants pocket. The other officer on the scene then recognized Robinson as a convicted felon and arrested him for illegal possession of a firearm. Reasonable suspicion that a person is armed does not by itself give rise to reasonable suspicion that the person is dangerous … [and therefore] we may not make the contrary assumption that those firearms inherently pose a danger justifying their seizure by law enforcement officers without consent…. Nor will we adopt a rule that would effectively eliminate Fourth Amendment protections for lawfully armed persons. Established Supreme Court law imposes two requirements for conducting a frisk, but no more than two: first, that the officer have conducted a lawful stop … and second, that during the valid but forced encounter, the officer reasonably suspects that the person is armed and therefore dangerous. The use of “and thus” recognizes that the risk of danger is created simply because the person … is armed. This case is not about traffic stops or “weapons” — it is about firearms and the danger they pose to law enforcement officers…. The majority [sidesteps] discussion of the two key issues in this case: (1) whether individuals who carry firearms — lawfully or unlawfully — pose a categorical risk of danger to others and police officers in particular, and (2) whether individuals who choose to carry firearms forego certain constitutional protections afforded to individuals who elect not to carry firearms…. [The answer is] “yes” to both questions. Confronting the inescapable reality that lawfully-stopped individuals armed with firearms are categorically dangerous reflects the heightened danger posed by firearms…. In sum, individuals who carry firearms — lawfully or unlawfully — pose a risk of danger to themselves, law enforcement officers, and the public at large. Accordingly, law enforcement officers may frisk lawfully stopped individuals who the officers reasonably suspect are carrying a firearm because a detainee’s possession of a firearm poses a categorical “danger” to the officers. The majority decision today necessarily leads to the conclusion that individuals who elect to carry firearms forego other constitutional rights, like the Fourth Amendment right to have law enforcement officers “knock-and-announce” before forcibly entering homes…. It is difficult to escape the conclusion that individuals who choose to carry firearms necessary face greater restriction on the concurrent exercise of other constitutional rights, like those protected by the First Amendment. Today’s decision … undoubtedly will have implications for police use of force.… If a police officer reasonably believes that a suspect poses a “threat of serious physical harm” [merely by lawfully possessing a firearm], he may use deadly force to protect himself. The court’s decision is abominable because it signals out the possession of a possible deadly tool to lose one’s constitutionally protected rights, and that’s wrong. First, the Constitution protects both the Second and Fourth Amendments equally, and the Founders didn’t put in wording allowing one to preempt the other. It is, in fact, pure sophistry, the rationalizing of breaking of the Constitution. The police in this case did not pull over the man for suspected violence, but for a missing seatbelt, and there was no indication that the man would turn violent — hence no reasonable reason to frisk him. Also, if the mere possession of a potentially deadly weapon is cause to lose one’s constitutional rights, any time an American gets within swinging length of a policeman, the officer should then be able to overturn that person’s constitutional rights, as hands and feet are used hundreds of times a year to kill people. If the Fourth Circuit Court’s decision isn’t challenged and overturned, not only will those carrying concealed become second-class citizens and lose their Second and Fourth Amendment rights, they could also, during a simple traffic stop, lose their lives. This entry was posted	on Monday, January 30th, 2017 at 5:36 pm	and is filed under Fourth Amendment, Second Amendment. You can follow any responses to this entry through the RSS 2.0 feed. You can leave a response, or trackback from your own site.